Share the Best Tastes of Philly with Kids. This is not about Philly cheese steaks although the hearty sandwich was first served in the city. It’s about Philadelphia for foodies with kids. During a recent trip to the city I had the opportunity to make my own list of family-friendly spots. 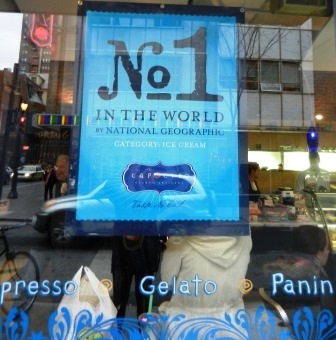 Capofitto Pizzaria & Gelateria in Philadelphia must for gelato lovers of all ages. When time is the only place to go is Reading Terminal Market. Located at the heart of the city, it is an awesome food bazar and one of America’s oldest farmers’ markets with more than 80 vendors spanning almost two acres. In spite of its size the atmosphere is festive and the patchwork of aromas defining each aisle most enticing. The vendors love to talk about food and many engage young foodies with samples. It is the place to find giant jar breakers, ginger cookies, petite apple pies, soft baked pretzels, heritage preserves, homemade waffles, oodles of chocolates including chocolate covered onions (who would have thought? ), and beautiful artisan cheeses. This is the place to sample Pennsylvania Dutch preserves, dine at the counter of the Dutch Eating Place and order Shoofly pie. Bassett’s Ice Cream counter serving ice cream since 1892 is still located at Reading Market. The Market is also the place to watch donuts and fritters being cut and baked plus if you are lucky, cheese being made. Beyond the Market, Philadelphia is the place to sample authentic Sicilian tomato pie at Marchiano’s Bakery. The best gelato served outside Tuscany is at Capofitto Pizzaria & Gelateria on Chestnut Street and their most filling Neapolitan style pizza cannot be beat. One uniquely Philadelphia tradition, Shane Confectionary in Old Town. It is the oldest operating chocolate factory in America and any visit will be rewarding if chocolate is your thing because their chocolates are both beautiful and scrumptious. Philadelphia’s Chinatown is not as expansive as New York or San Francisco but it does offer an array of shopping and eating possibilities. I suggest a low key dim sum eating adventure at I Green Asian. The owners have young children themselves and so they understand about family dining. And their hand-pressed noodles will delight even snarky little eaters.